Building a board of directors is not always easy. It takes a balanced group of individuals that come from different backgrounds who will come together to make the best decisions for their organizations. 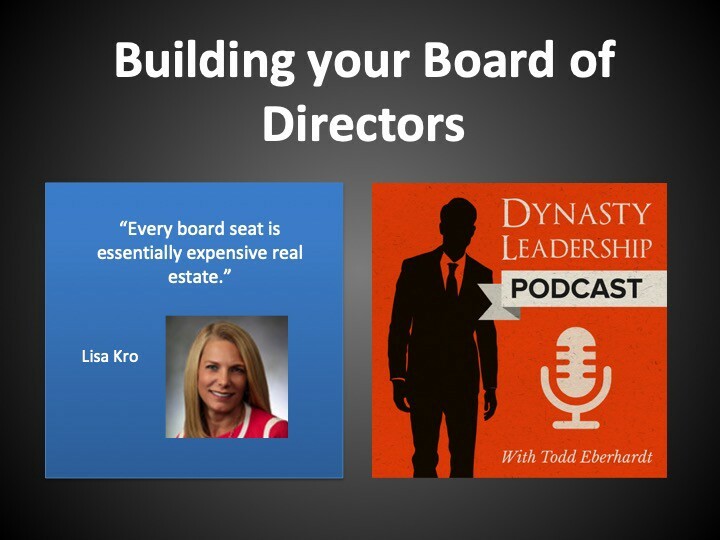 On this episode of the Dynasty Leadership Podcast, Lisa Kro, CFO of Ryan Construction joins the show to discuss her career and best practices for creating and serving on a board of directors. Given her previous role as a partner in the private equity world, Lisa has seen Boards from a variety of angles. Lisa has served on over a dozen boards working with nonprofits, privately held companies, and publically traded companies. She has spent time finding chair members, serving as chair herself, and filling in for many other positions. This episode focuses on the intricacies that go into creating the best possible board. Lisa joins the show to provides insight and tips in order to create an efficient and effective board. [2:40] How did Lisa get started in becoming a board member? [3:10] What’s the importance of having a board of directors? [4:35] When does it become necessary to have a board of directors? [5:20] What’s the difference between a board of directors vs. a board of advisors. [7:25] For a board of advisors, who should fill those seats? [10:00] What’s the purpose of a board? [12:50] It’s important to have a diverse set of people sitting on the board to help bring new perspectives into your company. [16:10] Who is in charge of setting the strategy for the business? Does the responsibility still fall on the CEO or is it now the responsibility of the board of directors? [17:30] How can the board help with a CEO succession plan? [19:45] Lisa shares how a board can help grow and develop talent. [22:10] How often do mergers and acquisitions work out well for companies? [25:20] You and your lawyer want to sit down and write out exit strategies for your board members. [26:45] What kinds of fiduciary responsibilities does the board of directors have? [28:15] How big should a board of directors be? [30:00] To be a part of the board, how much of a time commitment is it? [36:20] It’s important to reflect on past mistakes, but you should not dwell on them. Lisa recommends no more than 20% of reflection time during a board meeting. [39:00] It’s really helpful to have an appointed mentor for new board members coming in. [41:10] Another tip: Get board members to meet directly with high-performing employees.